Clyde Machine! - Crazy Wicked Awesome! Heads up about Clyde Machine’s upcoming concert! Greetings again one and all! It’s Clyde Machine, and I’ve got a show coming up. 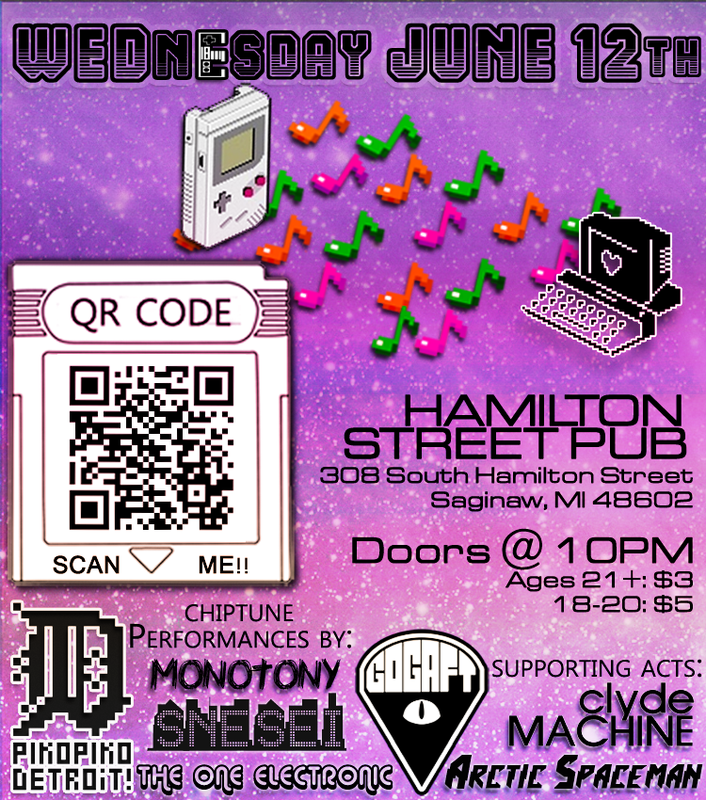 It’s a bit short notice, as it’s this Wednesday June 12th @ 10pm at the Hamilton Street Pub. Naturally, there’s a Facebook event with all the info in, it but I’d like to email you folks to make a personal request. This show is set to be big, featuring artists from both the Piko Piko Detroit and Gogaft artist collectives, two of the largest proponents of electronic music in the Michigan tri-city area. As cool as that is, we really need your help to get the word out on this show and have a huge showing! If you’re in the area of this show, let’s let the venue owners (and the rest of this area) know that we love electronic music and want to see more of it! If you can post this flyer to your Facebook and Twitter, you’re golden. But if you can do more than that, please do: get a whole posse to show up to the event, print and paste flyers at your school or near where cool kids hang out in your neighbourhood. If you’re not in the area of this show, you’re still able to help! Pasting tunes from myself and my co-performers will help pull us to your area as you’re building awareness and interest in our music, even if you’re on the other side of the globe! The only way we can make this event work is with your help, and this is my personal request that you lend us a hand in making it a killer night for you to kick off your summer with!Love & respect to everyone in the electronic music scene. Be sure to check this out if you’re in the area guys! Yet another Important Update From CLYDE MACHINE!